Gold is one of the most popular wedding colors this year! This pretty metallic goes with so many colors and types of ceremonies, and it looks beautiful on brides and bridesmaids alike. In honor of St. Patty’s Day and the legend of the pot of gold hiding at the end of the rainbow, we’re highlighting some of our loveliest headpieces, belts, and jewelry that are available in gold. Feast your eyes on these dazzling accessories that will make your fairy-tale wedding come to life! Top off your hairstyle with blissfully beautiful, nature-inspired elegance. Painted gold blooms with rhinestone-studded leaves on halo 6608 create an utterly romantic accent. Complement this design with a foldover veil or let it take center stage. Did you know that in ancient Irish legend, the oak tree was a gateway to the world of faeries? 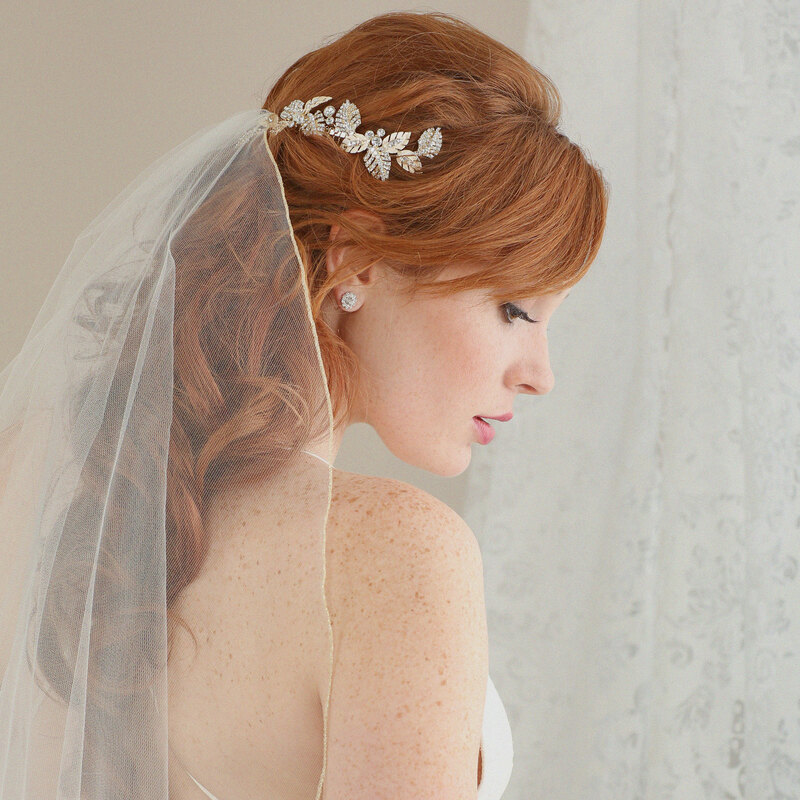 Add a bit of magic to your dream wedding with beautiful nature-inspired clip 6629. Available in silver or gold, metallic oak-shaped leaves and rhinestone swirls add a touch of enchanting charm to your look. For an absolutely exquisite bridal look, indulge in the classic beauty of pearls. Enhance your ensemble with gold or silver headband 6633, which features glittering floral motifs and pearl accents. Lovely with or without a veil, you can pair this dazzling design with gold or pearl jewelry. Glam up your ensemble with a glorious cluster of rhinestone-encrusted leaves. Inspired by nature, this lovely comb 6619 is available in gold or silver and features sparkling round rhinestone accents. You’ll look charming walking down the aisle or rocking the reception with this special design. 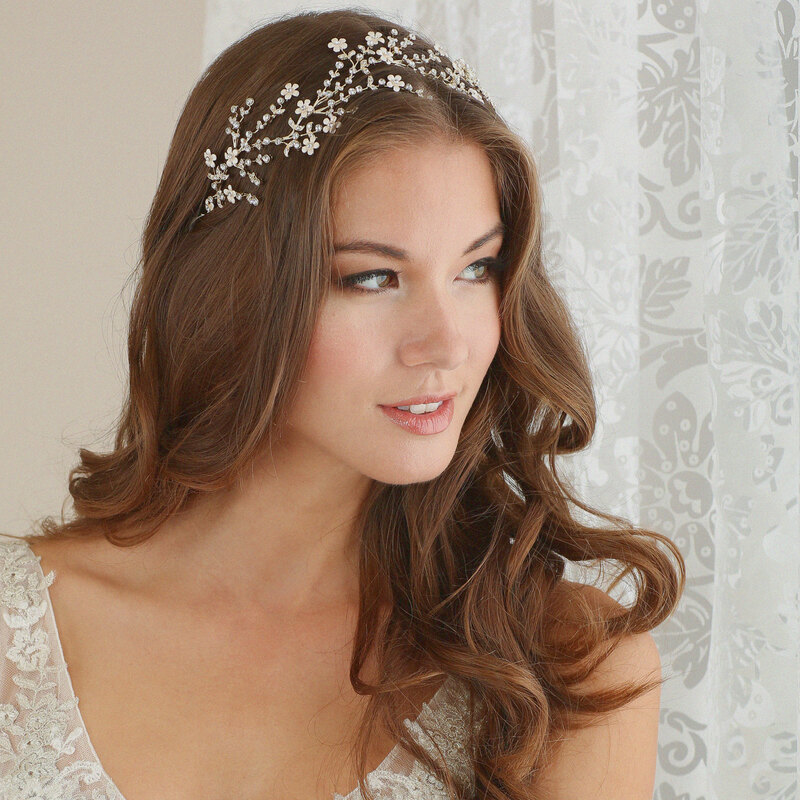 Transform your bridal style with dainty floral headpiece 6605. Rhinestone accents and tiny flowers catch the light with glorious sparkle, as if covered in dew drops. 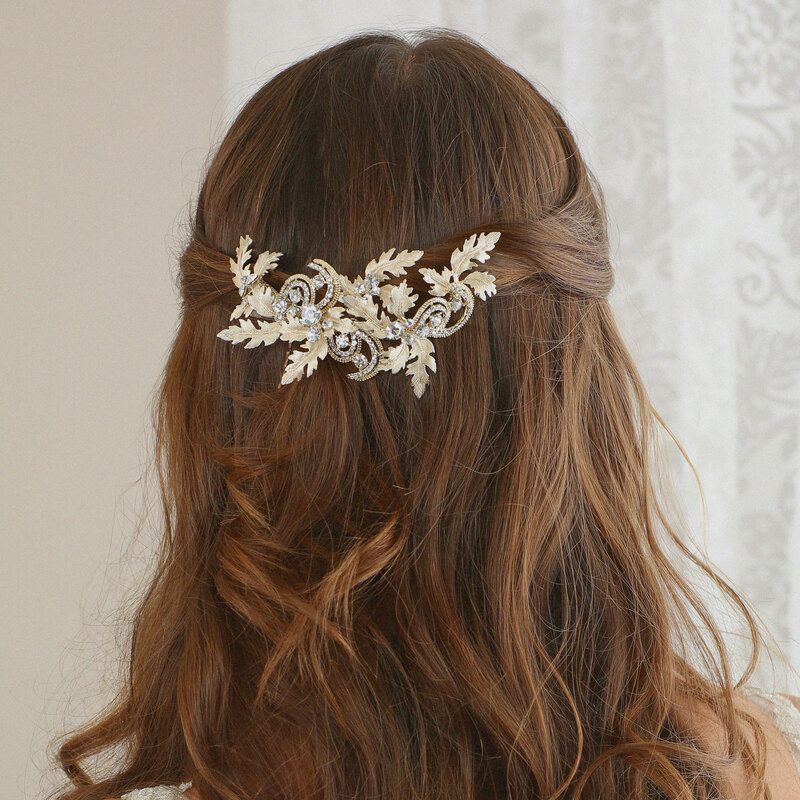 Available in silver or gold, this lovely headband is perfect for a spring or summer wedding. Want additional options in gold? 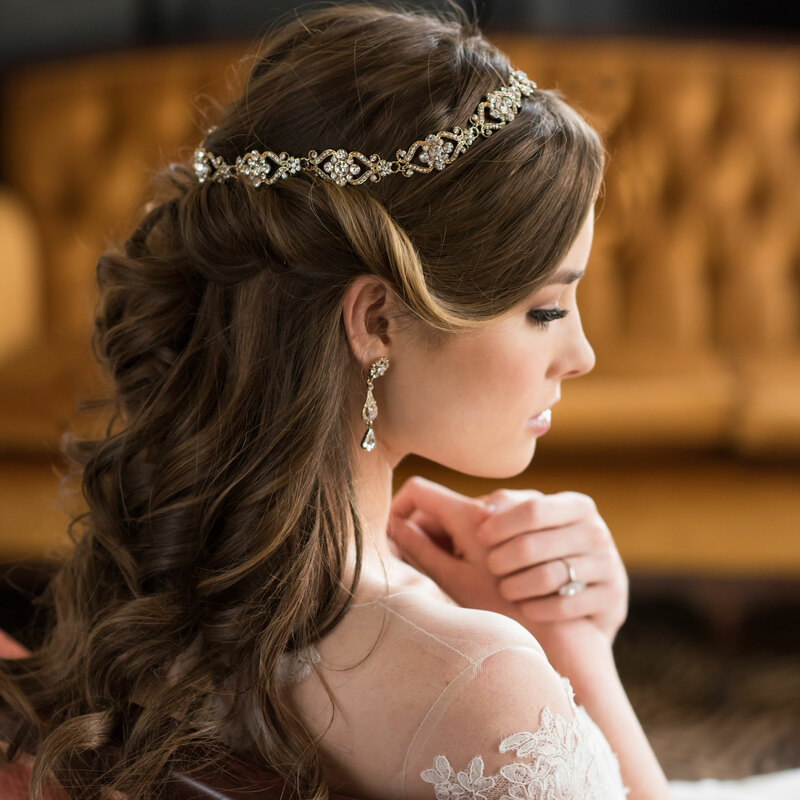 Check out our headpiece collections from 2015 for more gorgeous designs. We’ll have more gold pieces on our upcoming Fall 2016 line, as well, so be sure to check back with us!